While there is no shortage of opinions on the future direction of residential interior design style, what about exterior residential trends? Luckily, Ontario based exterior trim and siding company Royal Building Products recently released their exterior home style predictions for 2019. Why are these trends important? Not only will they affect homeowner remodeling projects, but will also impact homebuilder new construction as well as give us an insight into what exterior styles will be driving home sales in 2019 and beyond. Let’s highlight a few of the key trends detailed in the Royal Building Products report. Dark on Dark. Combinations of dark bold colors will grow in popularity in 2019. Shades of charcoal, black, dark blue, dark green and dark red will be used in various combinations of primary and accent colors to striking effect. A Variation on Classic Color Palettes. The classic white exterior home with black trim will gain popularity, as well as neutral colors such as grays and blues that convey warmth and comfort. Bringing the Inside Out. Outdoor living spaces have dominated consumer interest as homeowners are seeking more lavish, and useable, outdoor living spaces. Expect growth in outdoor amenities such as kitchens with covered roofs, designer outdoor furniture, and fire pits and portable heaters to allow for year round use. 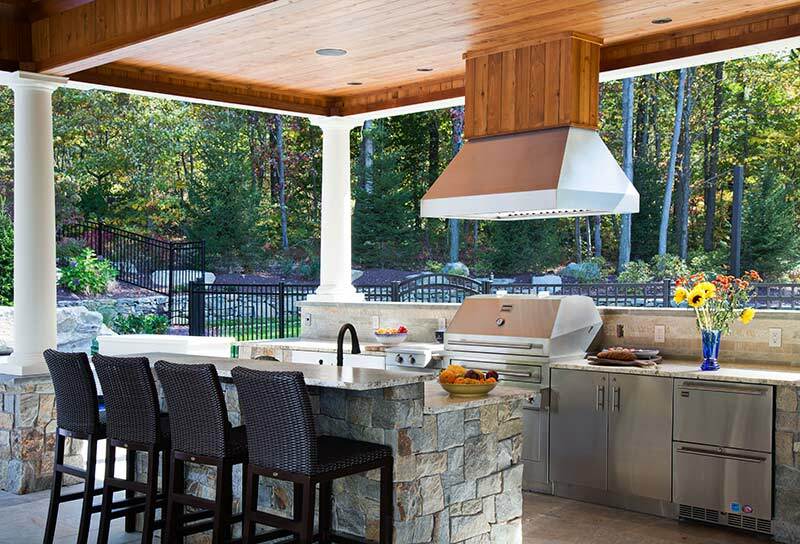 See our blog post on outdoor kitchens here. Adding Spa Elements Outdoors. The rising focus on physical and spiritual wellness is influencing not just interior spaces, but outdoors as well. We are seeing homeowners integrating meditation areas, zen gardens and peaceful water features into their outdoor spaces. Outdoor garden dining areas are growing in popularity as well. Rethinking the Shed. Garages and sheds are no longer for storage and garden tools. Backyard bars, man caves, she sheds, and external work spaces are taking over these spaces as homeowners are adding high end design elements such as siding, trim, windows and doors. See our blog post on the rising popularity of She Sheds here.